The ShowerGem is a great idea. We caught up with Sean McGarry to discuss his invention. I believe you had trouble naming the company? It did take a bit of time. Originally, the product was to be called The ShowerBoss Shower Caddy but when we applied for a trademark we ran into difficulty from Hugo Boss, who in their cease and desist letters stated that they “are a company with a turnover of four billion dollars annually”, not exactly someone a startup wants to be messing with. After seven months arguing with their German legal team, an agreement was reached where we could use ShowerBoss, but it left some red tape over the company which was less than ideal if we were to begin selling internationally in the future. So we parked ShowerBoss and began looking for something different. I met with Graham Clarke from Bank of Ireland and after a few cups of coffee, I found myself staring at a bag of ‘GEM’ sugar. I looked up the domain www.ShowerGem.com, it was available so hey presto, The ShowerGem Shower Caddy was born. ShowerGem was created pretty much by accident back in 2015. I have two teenage sisters which meant razors were left on the shower floor, soaps were thrown everywhere and bottles were balanced on top of the Mira shower unit. I tried using the metal caddies but the suction always failed, leading everything crashing to the ground. My dad thought there must be a better way so he went out to his workshop and created the ShowerGem. He made it just for our own shower but when I saw it I thought it was genius so I began turning it into a proper business. 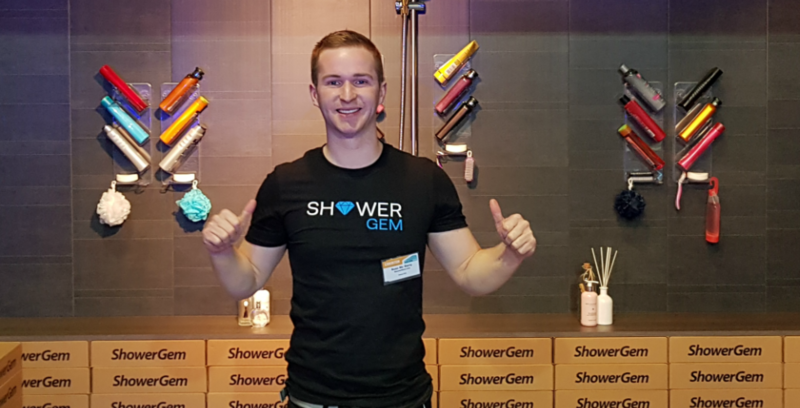 What makes the ShowerGem so brilliant is that it does a really good job at keeping your shower neat and tidy, storing everything at hands reach. Its angled shelves mean you don’t have to shake the bottles to get out that last bit of liquid and best of all it uses our own glue, that is designed to be used in wet areas to form a long-lasting bond to your tiles so unlike suction cups, the product is never going to fall. Overall, the ShowerGem is just a really simple solution that allows you to declutter your shower while ensuring no rust or bottles falling. Keeping the momentum up. For me, I like to see things constantly moving but when you are starting out, resources are pretty thin and you’re not quite sure in which direction you should be going. At times when a big decision is in front of you, you can find yourself standing still which kills all momentum and can drain the enthusiasm. I think it’s important that if you come across a big decision, to give yourself a day or two to think it over but then that’s it, you have to make your choice and move on. Once you start talking to distributors or investors, if they spot a period where things did not progress, it can cast doubt over your ability to get things done in a timely manner. The initial prototype development was actually carried out by my father who has his own plastic fabrication business. This consisted of numerous rounds of prototyping where we really played around with the design of The ShowerGem. After many iterations, we eventually ended up at a design that looks great, has a small slim-line footprint, is easy to install and fits neatly in every shower. I entered a number of competitions that had great cash prizes which we ended up winning. 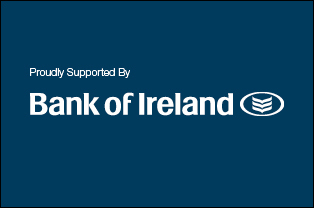 This gave us the money needed to take the business to an investor-ready stage at which point we secured investment from Enterprise Ireland’s Competitive Startup Fund. Shortly after we received private investment and that has gotten us to where we are today. Marketing is both time-consuming and expensive so it is definitely hard to get the product in front of people. We launched our product at the Ideal Home Show which meant our product was exposed to thousands. This got us a lot of sales in a very short space of time and since then our online sales have gone mad. Next stop for us is to hopefully get The ShowerGem on TV – this would be a huge boost so if anyone out there is in the TV industry or knows Ryan Tubridy, it would be great to hear from you. We are talking to quite a few distributors but these things take time so at the moment the major push is on driving people to our website. It takes a lot of trial and error before you can be sure that you are getting the right message across so I still have work to do but sales are going in the right direction. I am very happy now but if I was doing it all over again, then I would definitely spend less time on the product design. I can hand on heart say that it is the best shower caddy on the market. But we delved into way too much detail. At least now I can really stand behind the product and I am fully confident that people will absolutely love it. Are you inspired by anyone in business? There are quite a few Irish people that I’d admire as some have taken their products global. Lifes2Good is one that I really like as they have used some pretty inventive ways of getting products seen in markets all over the world. They take a pretty exciting approach to marketing and someday I’d love to see some similarities between ShowerGem and Lifes2Good. Any tips for someone looking to go into business? It’s clichéd but things don’t have to be perfect in order for you to get sales. Spend a bit of time tweaking your product design, but as soon as it is any way market ready then get it into the hands of paying customers.